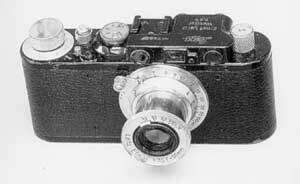 A Leica II, similar to the one that Reg Pidsley used for most of his war-time photography. Many of the photographs on these pages are the work of a recording engineer, Reg Pidsley, who was a member of the BBC's War Reporting Unit. Reg took over a thousand photographs from D-Day to VE-Day and on into 1946. He witnessed many historic scenes, though shortage of film meant he often had to record them with very few exposures. Fortunately he did spare some film for pictures of some of his BBC colleagues and their equipment. Following Reg's death in the mid-1980s the negatives were sold. In 1998 they, and all rights attached to them, were bought by Rob Clayton and we thank him for making them available for use here. The recordings made on this flight are available on a CD called "RAF Bomber Command At War 1939-45 (Vol 1)", which can be ordered from CD41's web site by clicking here. 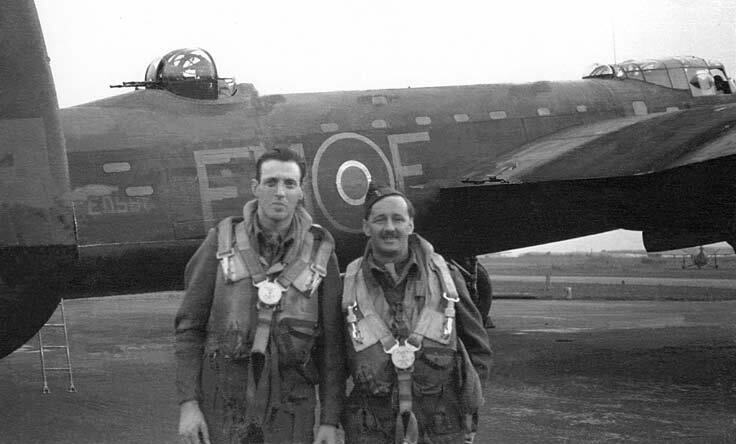 Reg Pidsley (left) with Wynford Vaughan Thomas in front of Lancaster F for Freddie of 207 Squadron prior to flying on a Berlin raid, 3rd September 1943. Reg recorded the voices of the crew during the flight. He later commented that when the bombs were released, "it was like going up in a lift" and the cutting head dug into the disc. "I worked with Reg in the late 60s in Maintenance Room 1 in Broadcasting House Extension when I first joined the BBC as a Direct Entry engineer to the Central Maintenance Unit. "I well remember a record, with no sleeve to protect it, standing on the shelf above Reg's bench and half-way across the playing surface was a small spot of silver paint. At this time well before the advent of CDs, such records were still very common (BH was still full of TD/7s !) so such an artefact was not particularly unusual in a workshop. "It was during a conversation one day, between modifying Leevers-Rich tape machines and repairing GPA/4s, that in response to my curiosity about the silver spot he related how he had, indeed, been an engineer during the war. As far as I recall he said that it was on one of the '1000 bomber raids' over Germany with Wynford Vaughan Thomas as War Correspondent that he had first to put the uncut disc inside his flying jacket to warm it up before recording WVT's report on his portable recorder. The temperature inside the bombers flying at their operational height was very low rendering the disc's coating too brittle to cut. "In the middle of the recording a massive bomb was released from the aircraft in which they were working and the aircraft rose, as mentioned above, 'like a lift' with the result that the stylus dug a deep hole into the disc! The silver paint, which looked like aluminium paint (or perhaps it was a special compound developed for the industry), was the repair which Reg had effected to allow the piece to be broadcast. "I have often wondered what happened to the disc as it struck me even then that it ought to be kept more carefully than perched above his bench! Reg was a very kind man and I remember him with affection." One of several photos taken by Reg in Delaware Road in 1944, just before the recording trucks began their journey to France. 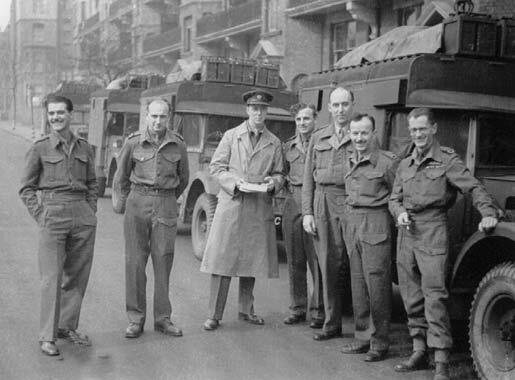 Included in this shot are engineers Sydney Gore (2nd from left), Wilfred Lindop (centre) and D. H. Farley (far right). If you can identify any other people in this, or any other shots in this section, please get in touch using the link at the bottom of this page. Reg Pidsley photos are ©Rob Clayton. None of the information or images on this site may be reproduced without permission from the authors. Last updated 30th November 2017.